The economy has rebounded and recruiters agree that it’s now a candidate’s job market. That means your employees have options that weren’t there just a few years ago. Have your HR policies caught up? 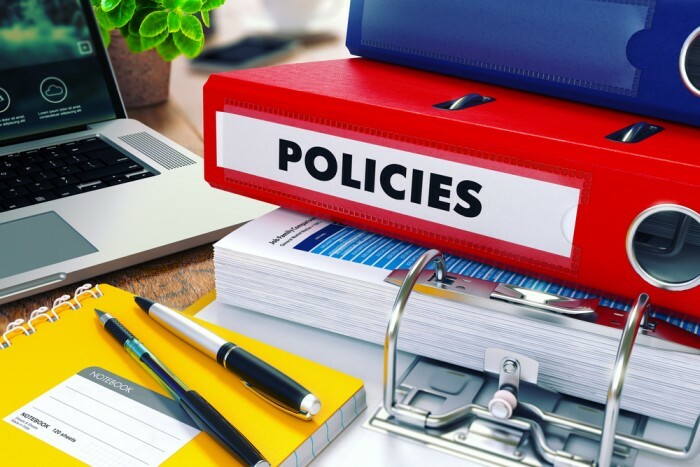 Dumb HR policies typically come about when managers and HR people don’t know how to productively lead and manage their workforce and resort to a far-reaching policy when a bit of guidance or coaching could easily fix a problem. There is no better way to ensure that you will have a constantly sick staff during cold and flu season than to pool your employee’s vacation and sick time together and force them to take their vacation days to recover from illnesses. It does nothing but encourage employees to come to work when they are sick, bringing whatever germs their kid brought home from school with them. The rest of the people they work with will follow in due course, and the vicious cycle will repeat itself until it’s been through the entire office. Productivity suffers. Morale suffers. Nothing gets accomplished during the winter because everyone is miserable. Here’s a better way: The answer is simple – if you’re sick, stay home. Don’t penalize your employees for catching the flu by enacting policies that encourage them to come to work get the rest of your staff sick in the process. Have your managers track the sick time of their employees to make sure it’s not being abused, but don’t count it against their vacation days. If you’re a manager in this situation, just let your employees “work from home” when they’re sick instead of forcing them to use their vacation days to recover. This unofficial policy will gain their undying loyalty. I once worked in an organization as a salaried employee and was literally forced to punch an old-school time clock every day. Meetings were scheduled at 8 am sharp as a response to one employee who would sometimes come in at 8:30, forcing everyone to get to the office earlier than the official start time for the sake of being on time to the meeting. Forcing your salaried staff to adhere to a strict schedule (unless, of course, you want them to work more than 40 hours a week) is one of the easiest things you can do to turn your best employees off. This isn’t the same as tracking time – keeping track of how many hours are dedicated to specific types of work for the sake of resource planning and prioritization. That information can be useful. But clocking in and out is nothing more than a way to ensure mediocrity by penalizing good employees for things that really don’t matter or contribute to bottom line performance. Here’s a better way: Your hourly employees are your hourly employees – and you need to track their time. Your salaried employees are called “exempt” for a reason. Some weeks they will work 40 hours. Some weeks they will work 60. Some weeks, they will work 35. As long as they are meeting their goals, let it go. You don’t win any points with your employees when you nitpick about them leaving at 4:30 when they stayed late every day the week before. Professional networks and discussions don’t just take place on LinkedIn; unofficial networking groups exist on Facebook, too. When you ban the social network in the office you also limit your employee’s access to information that could legitimately help them do their job better. But even if the use in question is personal and not professional, the rule of “trust the people you hire” still applies. If an employee is getting their work done and meeting their goals, does it really matter if they spent some time on social media catching up with their friends? Here’s a better way: Hire good people and trust them until they give you a reason not to. When that happens, manage to positive expectations and goals, instead of enacting far-reaching restrictive policies to correct the behavior of a few. Keep their attention focused on what you want them to achieve and the positive outcome of it – that will boost productivity more than banning Facebook ever will. There are any number of reasons why a person might want to take on work or projects outside of their day job – explore outside interests, develop their skill set, networking, or simply making some extra cash. An official policy forbidding outside work is just short-sighted and does absolutely nothing to contribute to the bottom line of the organization. It just creates unnecessary red tape and involves policing what your employees do in their private lives. Here’s a better way: Non-compete clauses, though more or less unenforceable after an employee leaves your company, make sense with regards to this issue. You can’t have your employees freelancing for your competition while they’re collecting a paycheck from you. But beyond that, encourage consulting, freelancing, or side projects as long as it doesn’t get in the way of their work. It’s a way for your staff to develop skillsets they may not otherwise have the chance to, which they can then bring and apply at work. If you’re afraid they’re going to leave you, then focus on initiatives that improve employee morale and job satisfaction rather than restrictive policies. I once read a story about two teachers who were long-time employees of a local school system. They were husband and wife and the husband was awaiting a kidney transplant. They were surprised to learn that the wife was a match, and requested leave from the school system to have the surgery. But then some genius in the HR department denied the leave because the surgery was considered elective in the employee manual. Of course after the story got out and was reported on the news, a committee overturned the decision, but imagine how this decision must have resonated within the school system. How would you feel about dedicating decades of your life to an organization that would deny a few weeks of leave for the sake of a life-saving surgery? Even if it didn’t apply directly to you, would you want to work for an organization that did this, or would you seek out greener pastures? Here’s a better way: Organizations are small social systems and when boneheaded decisions like this get made, everyone will hear about it. Use a little common sense and human compassion to avoid causing waves beyond the specific situation the policy is being applied in at the moment.